SpongeBob SquarePants, a new musical based on the iconic Nickelodeon cartoon, is headed to Broadway's Palace Theatre. Previews will begin on November 6 and an official opening scheduled for December 4. With a book by Kyle Jarrow, SpongeBob SquarePants features original songs by hit makers Sara Bareilles, Cyndi Lauper, John Legend and other big-name composers. The show is conceived and directed by Tina Landau with choreography by Christopher Gattelli. 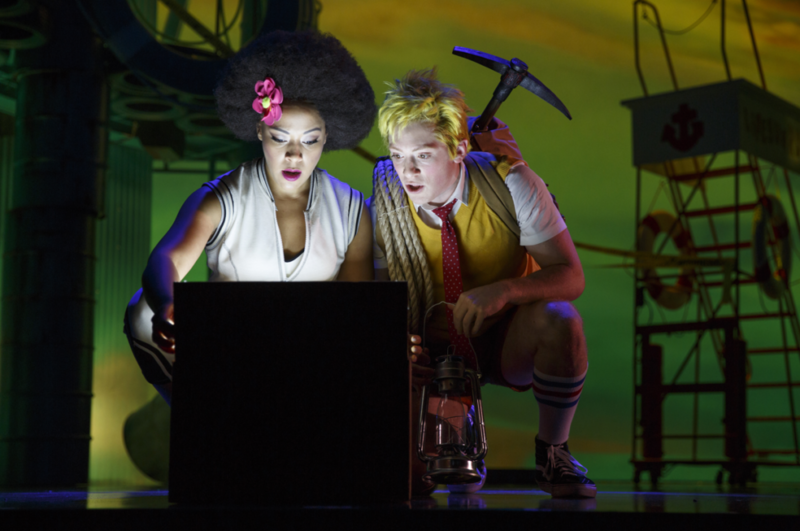 The musical first appeared in a summer 2016 debut production at Chicago's Oriental Theatre under the title The SpongeBob Musical. The stars of that production will move with the show to Broadway. They include Ethan Slater as SpongeBob SquarePants, Gavin Lee as Squidward, Lilli Cooper as Sandy Cheeks and Danny Skinner as Patrick. In SpongeBob SquarePants, stakes are higher than ever before as SpongeBob and all of Bikini Bottom face the total annihilation of their undersea world. Chaos erupts, lives hang in the balance, and just when all hope seems lost, a most unexpected hero rises up and takes center stage. In addition to Bareilles, Lauper and Legend, the full roster of composers contributing to the SpongeBob score includes Steven Tyler and Joe Perry of Aerosmith, Yolanda Adams, Jonathan Coulton, Alexander Ebert of Edward Sharpe & The Magnetic Zeros, The Flaming Lips, Lady Antebellum, Panic! at the Disco, Plain White T’s, They Might Be Giants and T.I., with a song by the late David Bowie. Jonathan Coulton provides additional lyrics. Orchestrations, arrangements and music supervision are by Tom Kitt. The design team includes scenic and costume design by David Zinn, lighting design by Kevin Adams, projection design by Peter Nigrini and sound design by Walter Trarbach. The character-driven cartoon SpongeBob SquarePants, launched in 1999, chronicles the nautical and sometimes nonsensical adventures of an incurably optimist and earnest sea sponge named SpongeBob and his undersea friends. The Palace Theatre is the current home of Sunset Boulevard, which is scheduled to conclude its limited run on June 25.